Experience the grandeur of Mount Rainier. Witness old-growth temperate rainforests, waterfalls, and impressive vistas. Whether you venture and sightsee by car, or choose to get outdoors and enjoy the many stops along the way, it’s all pure Rainier. An excellent introduction to the beauty, majesty, and mystique of Mt. Rainier National Park. OPEN: The entire loop is usually drivable and snow-free by mid-June and remains open through late October. The road between Ashford and Paradise remains open year-round. Begin this mountain adventure in the mountain community of Ashford located on State Route 706. A basecamp for recreation at Mt. Rainier, restaurants, car services, lodging, and campgrounds are available. Welcoming visitors to Mount Rainier National Park at the Nisqually Entrance stands a wooden entrance arch built in 1922 and reconstructed in 1973. Just inside this entrance is the oldest building in the park, a cabin built in 1908 that was occupied by a park ranger. This district is listed on the National Registry of Historic Places. You are now inside the park drive slowly and enjoy winding through the impressive old-growth forests. At 0.9 miles the West Side Road turns left and can be driven to where the road is gated at 3.3 miles. The road is closed at that point because of hazardous outburst floods and mudflows. Hikers often walk or bicycle the road from the closure to trailheads for several hikes including Tahoma Creek, Klapatche Park and Gobblers Knob. The Nisqually-Paradise Road continues to the Kautz Creek Bridge at about 3.3 miles. This is the site of a massive mudflow which occurred in 1947. The original road through this area now lies 20 feet below the surface. A parking lot will allow you to get out and take a look around. Take a short walk along an accessible boardwalk leading to an overlook of the 1947 debris flow and a splendid view of the mountain. Notice the young forest that has undergone a complete succession of re-growth within the past fifty years. A popular trailhead for the Kautz Creek Trail leading to Indian Henry’s Hunting Ground departs from this point. It is also a link to the world-renown 93-mile Wonderland Trail. At 6.4 miles you’ll come to Longmire. Open daily, year-round; be sure to stop. This is your first grand view of “The Mountain.” Visit Longmire Museum, one of the oldest museums in the National Park System with several exhibits on the cultural and natural history of the park. Stop in and take a look around the beautiful and rustic National Park Inn. Offering a full-service restaurant and gift shop, as well as a cozy lounge and oversized stone fireplace, it is the perfect place for relaxation on the mountain. See the historic 1911 log cabin adjacent to the inn, housing a general store. Also located here is the Longmire Wilderness Information Center with information on hiking and climbing in the area. From Longmire, stretch your legs with a walk along the Trail of the Shadows. This loop trail explores a mineral hot springs discovered in 1883 by James Longmire, an early settler in the region. This short nature trail displays an early original homestead cabin and a variety of plants and animals. In the winter this pathway is a popular snowshoe trek. For another nice afternoon stroll, walk through the operations and residential area and cross the wooden suspension bridge over the Nisqually River to a magnificent view of the mountain. It is also a starting point for hikers of the Wonderland Trail. Just up ahead, the road passes very pretty Christine Falls. Stop at the turnout on the right and have a better look. This waterfall can be viewed without having to lace up your hiking boots. Notice the 1928 stone masonry highway bridge forming a picturesque frame over the lovely 40 foot falls as it splashes down the lower reaches of Van Trump Creek. A small flight of stairs leads to another beautiful lookout of the falls. Six miles down the road, the one-way Ricksecker Point Road (signed as “Viewpoint”), offers fantastic views of the area’s beauty. See it all — views of Mount Rainier, Nisqually Glacier, Eagle Peak, Rampart Ridge and several of the mountain’s 25 glaciers including Pyramid, Success, Kautz and the Wilson Glacier. You can also see Point Success – the false summit of Mt. Rainier, Gibraltar Rock and Cowlitz Cleaver. The cone-shaped peak down the valley is Tumtum Peak. The Ricksecker Point Road is open in the summer months only. Don’t miss Narada Falls at about 15.5 miles; there is plenty of parking. Walk the short trail to a view of the falls at 0.2 miles. If you time it right you may catch rainbows dancing in the mist of the falls. This massive 168-foot waterfall is truly breathtaking, as the waters fan a thick mist out over this popular viewpoint. Be sure to stop at the pullout on your left to take a look at the Glacier Vista Exhibit. Learn about the fascinating glaciers of the mountain. Look up to the summit and see Nisqually glacier and its origin on the permanent Nisqually snowfield. Beginning at 14,000 feet, this is the fastest moving glacier on the mountain, moving slowly at a little over one foot a day. At about 18 miles the Nisqually-Paradise road reaches Paradise. At 5,400 feet, this area with its glorious views of Mount Rainier is the primary destination for many visitors to the park. Tourists are drawn to the area year round. In the summer months, alpine meadows are ablaze with the color of the wildflowers and during winter, its deep snow is ideal for cross-country skiing and snowshoeing. The Henry M. Jackson Memorial Visitor Center offers interpretive displays about the geology, flora, fauna and mountain climbing in the area. The Jackson Grill, a book store, gift shop and information on climbing Mt. Rainier are also located here. It’s just a short walk to the historic Paradise Inn with rustic rooms, the Paradise Inn Dining Room, Glacier Lounge, and a gift shop. Built in 1917, this beautiful inn displays hand-crafted furniture, a magnificent 14 foot grandfather clock and a rustic piano built by a German carpenter.Leaving from both the inn and visitor center is one of the most popular activities at Paradise — the short, family-friendly, paved nature trails. Suitable for just about everyone, these pathways lead through colorful meadows and offer spectacular mountain vistas. On the Nisqually Vista Trail, walk where the clouds go and see how weather shapes the landscape, plants and animals of these high-country meadows. 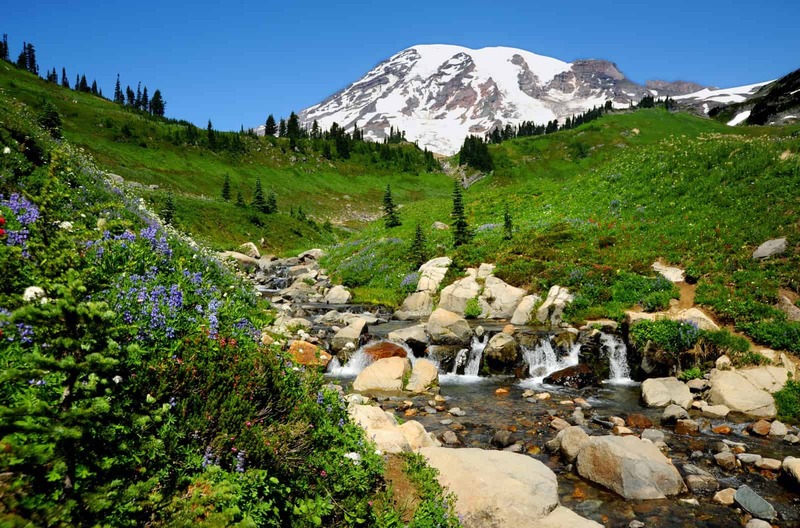 See splendid fields of wildflowers while taking in the stunning views of Mount Rainier and Nisqually Glacier. And keep your eyes peeled for area residents — the amusing whistling marmots sunning themselves on the rock outcroppings. Now descending down the mountain, stop and see Mt. Rainier’s stunning reflection in the crystal waters of Reflection Lake. Its picture-perfect beauty makes it one of the most photographed areas of the park — and you can get there by car. On a peaceful day, the reflection is almost too grand! For the best view, walk to the end of the turnout. A short trail leads to the lake shore, but sorry anglers, no fishing is allowed. In spring and summer, enjoy the beautiful wildflowers that line its shores. In autumn see the huckleberries that have turned brilliant shades of red and orange. Just across the road is the trailhead for the popular, but steep one mile trek to Pinnacle Saddle. The road switchbacks into Stevens Canyon where there is roadside parking for a view across the canyon of Martha Falls (46° 46′ 14.7″, -121° 41′ 23.1″) below Unicorn Peak. Water spills 150 feet in a dramatic display along Unicorn Creek. Watch the water plunge into the glacial valley, once occupied by Stevens Glacier. A fascinating feature of Mt. Rainier National Park is intriguing Box Canyon. The Muddy Fork of the Cowlitz River at only a few feet wide has, over time, cut a channel into the mossy rock and created a canyon 100 feet deep but only 15 to 30 feet across. Walk a bridge across the canyon for a dizzying view of this deep forest canyon. A nice picnic area is also located here. In a little over four miles, pull off to the right into a parking area for one more look at splendid Mt. Rainier. Looking up the valley, see the mountain and its summit. For those with a sharp eye, look to see a portion of Margaret Falls. Cascading over 1,100 feet, this is the park’s tallest waterfall. Everyone in the family will enjoy an easy 1.5 mile loop through Grove of the Patriarchs, an excellent example of old-growth forest. Witness ancient stands of gigantic Douglas-firs, western hemlock and western red cedar, some estimated to be over 1,000 years old. People come from all over the world to experience walking through ancient forests of trees with 30-foot circumferences. To reach the trailhead, turn into a parking area (left) just before a bridge over the Ohanapecosh River. Another popular hike in the area, Silver Falls, is 1/2 mile south of the Grove of the Patriarchs. down to an elevation of 1,914 feet, make a stop at Ohanapecosh. Situated among Douglas firs, western red cedars, and western hemlocks, visitors can experience the beauty and complexity of an old-growth forest. This lush area offers a visitor center featuring exhibits about local history, wildlife and the old-growth forests found in this southeast corner of the park.Speak with a park ranger and learn more about the fascinating geology of the area. See the remains of the historic hot springs in the boggy area near the visitor center. Guided interpretive programs, maps, restrooms and book sales are available. Also, find the very popular Ohanapecosh Campground. A well-designed camping area; sites are sorted into smaller loops to keep visitors from feeling overcrowded. The Ohanapecosh River roars through the campground, separating the two camping areas. Stand among the giants — giant trees that is… find this nicely forested campground situated along the Cowlitz River. La Wis Wis is a popular place for long stay camping as well as overnighters passing through. Find nice campsites among some really large trees along the Cowlitz River. Many trails lead to the water’s edge. Take a short walk along one of these trails and enjoy a bite to eat at the day use picnic area. Nestled deep in the forest, watch bubbling Skate Creek as you drive its namesake road. Along this winding, paved, but primitive road, see countless waterfalls cascade along the roadside. See blankets of drooping mosses and experience the beauty and serenity of this little gem. Memorable fall color displays have earned this road the honor of “Best Sunday Drive in Lewis County for Fall Color”. In the wintertime, this road is closed to vehicle traffic and the Skate Creek Sno-Park becomes a popular destination for the snowmobiling crowds. END: Return to Ashford after a fun-filled day on the mountain. You’ve seen waterfalls and wildflowers, old-growth forests and old-time lodges. A day of beauty spent at Washington’s premier natural icon. NOTE: All roads in this itinerary are windy and many have steep drop-offs on the either side. Always drive with caution and expect wildlife. Please check local ranger stations for winter road closures.